Central European University may have been saved from closure this month by the crowds that went into the streets to defend it. The threat comes from new licensing requirements that could keep CEU from operating legally in Hungary. 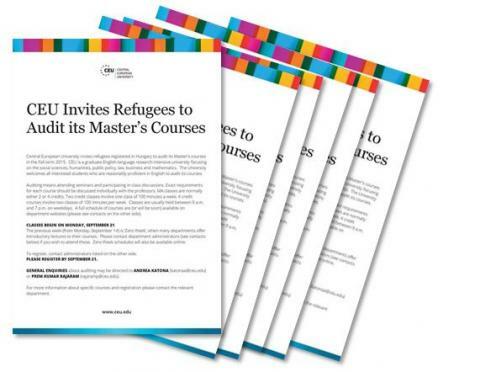 The president of this private, English-language university, established by George Soros, Michael Ignatieff, deliberately stirred up public concern by posting analyses of the new regulations along with calls for general support. The effort culminated in a widely covered press conference where he stated that a vindictive government was putting the University’s existence at risk. It’s rare to see university heads trying to stir up the public rather than head them off. They’re going to have to get much better at it, for the simple reason that right-wing leaders all over the world have positioned knowledge institutions as enemies of regular people, and universities will need to figure out how to get popular support. This is obviously the case in Hungary or in Turkey, where the newly constitutionalized despot Recep Tayyip Erdogan has the educational system by the throat. But we shouldn’t treat these countries as bizarre extremes. The American Right always runs against the university, and Trump owes much of his success to his ability to cast “political correctness” and knowledge-based policy as threats to the real Americans. CEU may be a model for the US and UK as well as other regions where knowledge institutions—universities but also high schools, laboratories and the press—operate under political threat. allows the Hungarian government to block or abrogate contracts and arrangements between educational institutions located inside and outside of Hungary. CEU statements have highlighted the illiberal implications. The University has accused the government of violating its own legislative procedures in rushing to pass this law and making a discriminatory assault on CEU by writing rules that will affect it alone. It accuses the government of thereby undermining the conditions of academic freedom. But the university’s advocacy did not stop there. 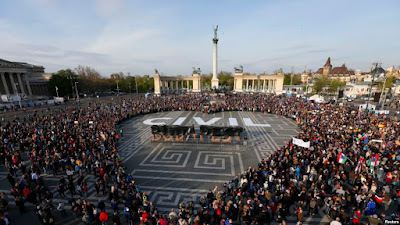 All this seems like a co-ordinated attack not just on academic freedom but on freedom of association, and, finally, on democratic freedom,” Liviu Matei, provost of the CEU, told The Telegraph. After much international pressure and many large street protests, the government may have retreated on April 12, although the "compromise" it proposes seems to have been explicitly blocked by the new legislation. The European Commission has also announced an investigation into the legality of the legislation. The situation is likely to drag on interminably. A straightforward compromise is undermined by Orbán’s need to campaign endlessly against his government’s internal enemies. He has positioned CEU as a front for George Soros’s liberal foreign interests and a leader in the NGO assault on Hungarian sovereignty. Hungary has become a bellwether for illiberal democracy in Europe and an inspiration for illiberal democrats throughout the region. 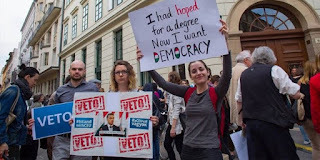 Hence, the struggle over CEU is not just about that unique university, it is about all universities, and it is about liberal democracy. If we don’t take a stand now, we will be fighting similar measures in Poland and other countries soon. 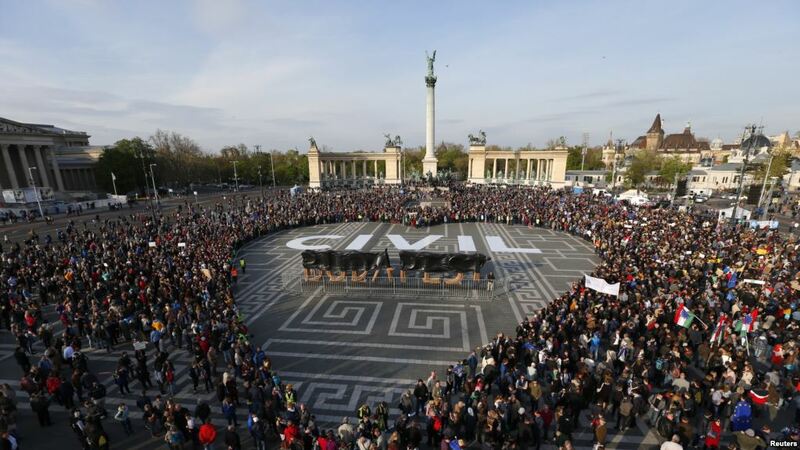 The time of accommodating Orbán must end now. It has failed. It has not moderated him, as [the European Popular Party] leaders continue to claim. Rather, it is radicalising others and hollowing out the very values the EU, and EPP, claim to stand for. This week, Merkel took a strong stand against Orbán, as he attacked her refugee policies in a by-now familiar Islamophobic, far-right speech at the EPP meeting in Malta. It is time the EPP chooses between Merkel and Orbán, between liberal democracy and illiberal democracy, between a worldview in which universities are encouraged to be critical and independent and one in which critical and independent universities are threatened with closure. 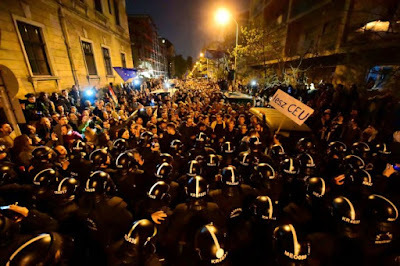 CEU is in fact the kind of cosmopolitan institution that declares its independence of state interests, even as it claims to represent the freedoms valued by ordinary Hungarians. This is a difficult combination for CEU or any university to sustain—an opposition to state control of freedoms in the name of academics and citizens alike. In his press conference, Ignatieff didn't always manage this: he said many nice things about how much CEU likes Budapest and wants to stay (it has offers to relocate from the city of Vienna and others), and yet he stressed international excellence rather than national service, all while expressing strong moral indignation against the Orbán government in English. I don't know the Hungarian word for "entitlement," but I'm sure it was used in TV commentaries on the CEU response. This is not Ignatieff’s failing: universities everywhere have been unable to imagine being both liberal and populist, in which they claim intellectual freedom, tenure, and at least limited workplace self-governance as rights that should be extended to non-university citizens in order to improve their lives. Dependent on selectivity and rejection as key indicators of success, universities have had a hard time bringing academic greatness together with mass inclusion. But that is exactly what is needed now. Universities are popularly associated with two current failures of liberal democracy: to generate peace and security through the war on terror, and to create general prosperity through the knowledge economy. Orbán’s political theater is designed to remind everyone that today’s liberal enlightenment has helped create—and excuse—high levels of sociocultural and economic polarization, and that under its system many people, sometimes large national majorities, feel the lives they want to be slipping away. Of course the Right has no coherent foreign policy or economic solution either, and their ideas further polarize and make inquality worse. But that doesn’t invalidate its point that liberal economics has left majorities even of wealthy societies behind. Universities, on the other hand, have done well over the past thirty years—the universities, that is, whose business model focuses largely on creating the private goods that this recent order has favored. These have mostly been the already fairly wealthy private universities that lack responsibility for mass education and can focus on increasing private goods—tech transfer for business, human capital for graduates. In the process, universities lose the interest of the majority of the population that doesn’t benefit from these private-good transactions, which doesn’t matter for private universities with strong brands and very high tuition incomes, and who are willing to shift investment towards direct returns on investment. The model doesn’t work for public universities, which have affordability obligations and very large numbers of students who must be properly taught. They need support—financially and politically—from the society as a whole. Their teaching and research thus needs visibility and obviously to offer widespread public benefits, as, for example, from longstanding research validating the access of regular people to workplace rights, good wages, political freedom, and cultural self-determination. Liberal freedoms, academic quality, and egalitarian benefits can be reconciled in a public-goods framework. I argue this at length in The Great Mistake (the mistake is our application of a private-sector business model to a public good), and in brief in my Inside Higher Ed piece last week. Great universities like CEU cannot appeal to the wider population when cut off from a full-scale public good framework that citizens can see will benefit everyone. When universities fail to create a mass base, they are permanently vulnerable. Authoritarian rulers can take advantage of this wherever it happens--Hong Kong, Russia, and Turkey, for starters. U.S. and U.K. universities obviously have much better civic and legal protections. They aren’t threatened with closure, at least politically, but they are threatened with permanently declining social standing, influence, and funding. This is in part because they haven’t made the public good funding base a popular issue. They stress their exceptionality rather than their embeddedness. They equate quality with selectivity and ranking rather than with inclusion and mass progress. It is finally dawning on U.K. university leaders that the sector's endless talk of value for money and money from international students has meant neglecting the less mobile sectors of its population, who aren't rushing to their defense. Carter reminded me of George F. Will, who 25 years ago used his column in Newsweek to anoint Lynne Cheney as "secretary of domestic defense" in the culture war on exactly what was at stake at Middlebury--anti-racism ("Literary Politics," April 22, 1991). Carter et al. were unable to support a university that grants academic freedom to a full range of views even when they erupted in adversarial expression, meaning they were unable to support a liberal populist university rooted in its immediate society. This failure to define the university, among other things, as a site of intellectualized social conflict shifted the image of the American university within a few weeks of Trump’s inauguration from a bulwark against tyranny to a sponsor of it. To repeat, it was not the downshouters who did this, but the liberal opponents of the popular university that, since regular people are there, will occasionally erupt in downshouting. I personally oppose downshouting, but it needs to be put way down the list of social problems of our time. CEU must be defended by the academic community elsewhere. But it, like universities in general, will be saved only by the general public. And that means universities in all our countries giving the general public better reasons to feel we're on their side.